The 15 Best Picnic Spots in Maine! Maine is like one big postcard. From our breathtaking rocky seaside cliffs to white sandy beaches to our tree covered mountain tops, Maine is beautiful. 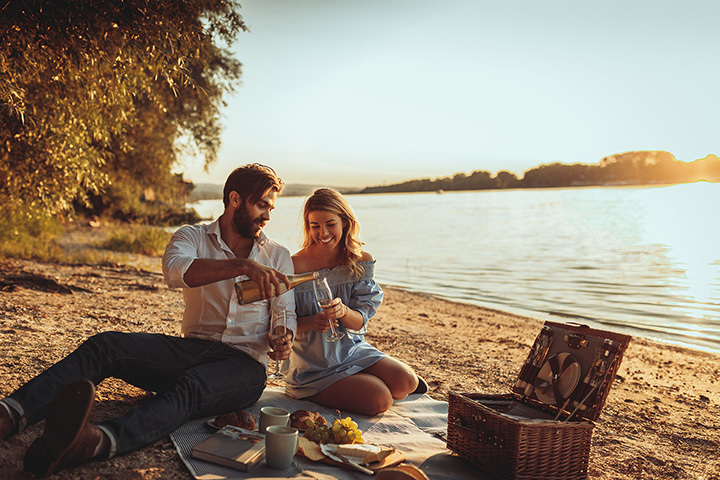 Whether you prefer the coast or the woods, you will have no trouble finding the perfect picnic spot in Maine to relax and enjoy the great outdoors. Fort Williams is one of the most popular picnic spots in the Greater Portland area. With stunning views of Portland Headlight, the rocky coastline, and old military forts, how can you not love this beautiful and relaxing spot by the sea? With pine forests, meadows, and coastline, Wolfe’s Neck Woods State Park offers a variety of spots for the perfect picnic spot. The park has many picnic tables and grills throughout the park so wherever you choose, you’ll be able to cook up the perfect meal. Reid State Park is the prefect destination for a beachside picnic. From Todd’s Point to Griffith Head, you’ll find plenty of ledges or stretches of sandy beach to roll out your picnic blanket and basket. Or enjoy one of the many picnic tables and grills along the rocky coast. Sohier Park is home to Nubble Lighthouse, one of Maine’s most photographed lighthouses in southern Maine. There are no picnic tables here so bring your blanket and basket and enjoy the beautiful views of Nubble Lighthouse and the Atlantic Ocean. Who doesn’t want a picnic with a view? Either drive or hike up Cadillac Mountain, which sits 1,500 feet above sea level, and enjoy the panoramic views of Bar Harbor and the Cranberry Islands. Better yet—enjoy a breakfast picnic while watching the sunrise. Fort Kent State Historic Site is home to an old fort that was built for the border dispute between Canada in the United States during the “Aroostook War” of 1839. Enjoy a lovely picnic overlooking the lazy curve or the St. John River and the Fort Kent Blockhouse. Quoddy Head State Park is Maine’s most Eastern state park. Enjoy a lovely cliff-top picnic with the ultimate background—the red and white stripes of the West Quoddy Head Lighthouse. The Eastern Promenade is a popular spot in Portland to relax, play games, and walk your dogs. Grab a blanket and some local crew brews and head the Prom for a late afternoon picnic and people watching. Camden Hills State Park is perfect for an autumn picnic under the red and gold of the trees. Hike up to the top of Mount Battie and enjoy a yummy hand-packed picnic on a large granite rock while overlooking the ocean and the top of Camden. Bring the kids and enjoy a lovely picnic in the Maine Wildlife Park surrounded by native Maine animals. The Maine Wildlife Park in Gray is home to moose, deer, eagles, and even a couple of skunks. Bring your own lunch and splurge on an ice cream at the snack shop. Located not far from Farmington, Smalls Falls is a popular waterfall to visit during the hot months. Bring your picnic basket and your swimsuit and enjoy a lunch on the gorge with a little afternoon splash in the falls. Enjoy a picnic under the pine trees while overlooking one of Maine’s most popular lakes at Sebago Lake State Park. With heaps of grills and picnic tables you’ll be able to cook up some traditional Maine foods like red hot dogs! Located between the Maine State Museum and the Kennebec River, Capitol Park in Augusta is a great place in Maine’s capital city to enjoy a relaxing picnic after a long day of work. Designed in 1879, Deering Oaks Park is Portland’s largest park. With acres of meadows, sporting fields, and woods, the park is a great place to spend a summer afternoon relaxing on a picnic blanket after shopping at the Saturday farmers market for delicious local foods. Grab a couple of lobster rolls in Dock Square and walk the short distance to the 60-acre Franciscan Monastery for a romantic picnic near the mouth of the Arundel River.